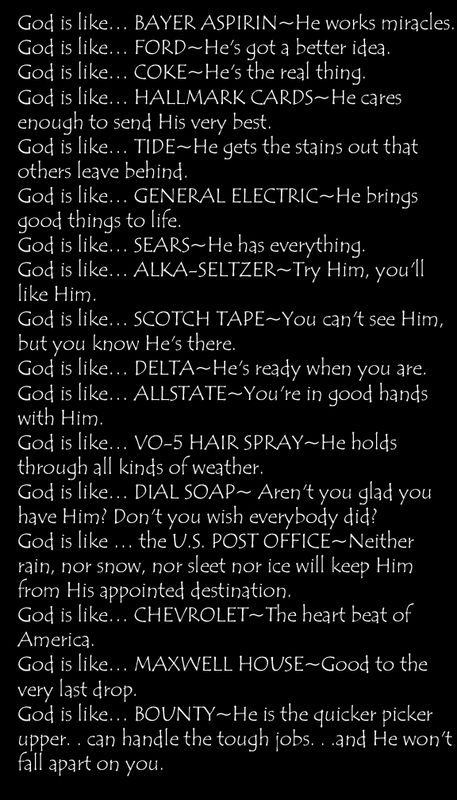 At first, this comparison of God to popular name-brands might seem humorous enough to emit a chuckle. But when you think about it, this is devaluing God. We are comparing the Infinite God to man-made products. I'm not saying that these things aren't true. God is a worker of miracles, He does cleanse us of stains, He is always there. It's the irreverence that bothers me. 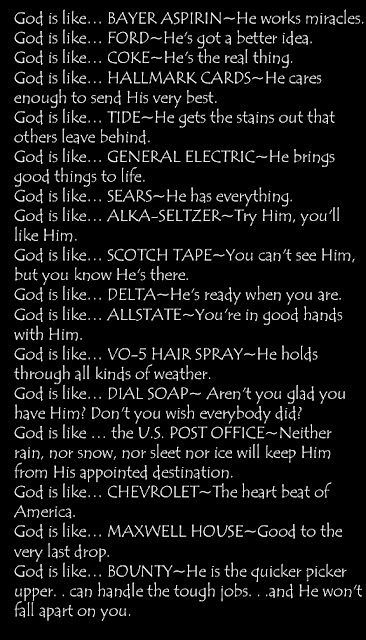 Like, seriously... comparing God to hair spray? Doesn't that seem a little... well, demeaning? God is God. He is the Creator of the universe, the Savior of the world, the Lover of our souls. He is everything that is good and right. Words fail to describe Him. But just because our human vocabulary cannot portray who God really is, doesn't mean that we should intentionally belittle Him. Perhaps I'm taking this too seriously. Maybe it really doesn't matter. Someone was just being creative and came up with a list of products that possess qualities similar to God's. Wonderful. But God deserves our ultimate respect and reverence. We shouldn't be making jokes about Him. Well, there's my rant. Perhaps a little silly, but I don't appreciate people making light the Majesty of my God. So there. Just so you all know, I realize that people don't walk around saying, "God is like Chevrolet". I doubt they even think it. I'm sure the person who wrote the above comparisons was just trying to be funny. But it still bothers me nonetheless.